November 30, 2015 – Vancouver, BC – Canadian distributor Redwood Plastics recently announced that they will be adding Turtle Plastics to their extensive list of manufacturing partners. The new products that will be available are from Redwood Plastics include; Redco™ DURA CRIB & DURA STAT, a stable alternative to wood blocks, Redco™ Turtle Tiles and Matting, a slip resistant flooring material, as well as other products that are made from 100% recycled material. 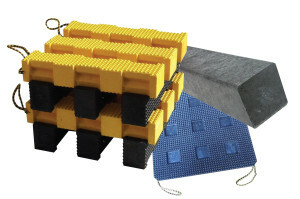 All in the name of increasing safety, the entire Turtle Plastics product line provides cost-effective solutions to reduce injuries and accidents in both commercial and residential applications. The Redco™ Dura Crib & Dura Stat products are sought after by first responders to increase response times by securing vehicles quickly to aid trapped civilians. For over four decades, Redwood Plastics has specialized in helping its customers find solutions to a variety of issues such as shock, abrasion, noise, wear and friction. They work in a number of fields including forestry, mining and drilling, construction and transportation, agriculture, marinas, amusement parks and others. Redwood Plastics has four locations throughout Canada as well as three branches in the United States.